How do we know where someone is within the world of dementia? It's as varied as the people experiencing it. Some people can talk about it. Some can even say, "I have Alzheimer's." Others don't really know they have it. Or, it's too shameful to say out loud. Our younger generations may think everyone can say everything about anything. There seems to be a serious lack of verbal filters now-a-days. However, our older generation, often referred to as The Greatest Generation, is our World War II generation. These parents of the Baby Boomers – they don't really talk about things. Like when they returned from World War II. They didn't talk about it. They came back and went to work. They used the GI Bill, pursued education, bought houses, started families and got busy creating the middle class in America. But, they didn't talk about it. Most of them also don't talk about end-of-life processes and many don't admit dementia. Furthermore, if they are suffering with dementia, their ravaged minds often don't allow them to articulate the process. This disease strips away the very neurons they need to describe it to us. We lack any lab tests that can tell us where we are in the wide ranges of dementia. No enzyme level or blood test can identify its degree of severity. So, how do we evaluate where they are? How can we talk about it amongst family members and with healthcare providers? The use of vague terms like "late stage dementia" versus "end stage dementia" are frustratingly unhelpful. How do you really define late stage or end stage? How do you define moderate or severe cognitive disease? They are all nebulous descriptions at best, subject to each person's interpretation and qualitative view. We need something quantitative, something we can all see and agree upon. The FAST scale is just that. It was exasperating when we met with my mother's neurologist and he told us, "Well, she is probably in late state dementia, but not yet in end stage." What? And just what is going to tell us when she is in end stage? We left his office and vowed never to go back. It was a waste of our time and money just to have him tell us she has dementia. Yeah, we already knew that. The greatest help came when the Palliative Care Nurse Practitioner presented us with the FAST scale. Finally, something we could quantify. Here was a way to make sense of this intangible, yet devastating, disease. We were grateful that we could see where our loved one fell on the scale. Family members could discuss it with clarity. "Here's where we are. Here's where we're going." We don't know how fast or slowly we'll get to the various stages, but we could see the inevitable steps that were coming. And we could see the end result. As shown on the FAST scale, Stages 1 through 5 are simple numbers with a description. Once you get to Stage 6, it breaks down into categories of 6a through 6e. Then, at Stage 7, it is divided into 7a through 7f. When someone enters Stage 6, Palliative Care might be an option. Once someone enters into Stage 7, it is usually considered appropriate to be in Hospice. If you know anyone with dementia, take a look at the FAST Scale. It clarifies where your loved one is with the disease process. The FAST scale provides a useful tool when we communicate with healthcare providers. Better healthcare decisions are made when we are all on the same page and use the same terms. Pick up any article about aging and you'll see that 50 is the new 30 and 70 is the new 50. As Baby Boomers head into, dare I say, old age, they're approaching it like they've attacked everything in their lives: head on and with a determined, "We're gonna change this!" It will keep you young! You won't age! How many other products and ideas can you name that you "should" be doing? One more face cream, one more lip filler or Botox treatment, one more yoga pose. If you could just do one more something, then maybe you won't die. The Baby Boomers' can-do attitude worked in the 1960s, many things did change. And it will even work now, 50 – 60 years later, but only up to a certain point. We will still experience aging. We will still die. Perhaps Baby Boomers will promote changes that allow for better measures to prevent extended suffering. We hope they will add enough voices that aging people will have a better quality-of-life and have more end-of-life choices available to them. With all of our advances in medicine, we are able today to force human bodies to stay on the planet, whether they should or not, long after our bodies would have naturally let go. Then, there's the added complication of dementia that strips away our ability to have a vote in the matter. So, we are left to ask the difficult questions. When is it simply too much? When are we needlessly suffering? When do we say a last good-bye? There is not one physical body that has not slipped off the mortal coil of old age and into death. There is not one "attitude" that stopped anyone from dying eventually. Somehow, when we die earlier, we berate ourselves for not being able to muster up "enough right attitude" to prevent it, when in fact, it was the natural process of the break down of our bodies. Not due to our attitude at all. I don't think we have to worry about sending old people off to their demise based on the criteria of age alone. However, we have to have some frank discussion about how we will define qualify-of-life. Atul Gawande explores the many facets of aging and end-of-life decisions in his book, Being Mortal: Medicine and What Matters in the End. This book was recommended to me by the eye specialist treating my mother for wet macular degeneration. In his specialty, the majority of his patients are in their last 10 years of life. His entire staff read the book to better help and understand their patients. Although trained as a surgeon, Gawande writes at a level that all of us can understand. He breaks down the aging process of our bodies so that it makes sense. No, we can't stop aging, but we can help. If we have an idea of what's coming, we can take steps to prepare for it. He's not afraid to ask the question: how are we going to die? How do we die when so many interventions exist that can force us not to? Gawande explores this slippery slope that medicine finds itself on. His book is not about giving us an answer, but rather increasing awareness to better be able to make decisions for ourselves and our loved ones. I'm a Women's Health Nurse Practitioner and all my healthcare practice is about "fighting the good fight" – doing everything to fix and heal my patients and beating back death at every step. As my mother experiences an extended end-of-life process, this book helped me to understand the breakdown happening in her body. It helped me to see the parts of aging that I can't fix. Being Mortal even provided a sort of comfort that I wasn't failing in my mother's care. Gawande describes how the aging process profoundly effects each and every organ. No part of us is spared. If you are aging, or if you know anyone who is aging, Being Mortal is a must-read. And since we're all aging, no matter what we may think, we all need to read this book. It's worth more than one read. When you love life totally, how can you avoid death? You have to love death also. When you love a flower deeply, you love its withering away also. When you love a woman deeply, you love her getting old also, you one day love her death also. That is part of her life, part of woman. Old age has not happened from the outside, it has come from the inside. The beautiful face has become wrinkled now – you love those wrinkles also, they are part of your woman. You love a man and his hair has grown white – you love those hairs also. They have not happened from the outside; they are not accidents. Life is unfolding and now the black hair has disappeared and the gray hair has come. You don’t reject the gray hairs, you love them, they are a part of the man. Then your man becomes old, becomes weak – you love that too. What better teacher than Nature to capture the essence of birth and death and how love hums at the heart of it all? Observing nature in my backyard, I decided to photograph the blossoming flowers. I positioned myself to capture their humble beginnings of greenery. Eager buds stretched forth as they pushed their way into the world. Twirling out of a spiral, they opened their petals to become the flower they were meant to be. Everyone loves flower buds and blossoms. As I documented their journey through the lens of my iPhone camera, I began to wonder – why isn’t the entire process considered beautiful? I came upon this quote by Osho and it captured what I was feeling. He gets to the core of the issue. We can love the entire process from beginning to end. We don't have to be limited only to the parts that our limited minds deem to be pretty. Even fading petals have a song to sing, don't they? Here, a flower opens its petals from within a spiral. Now the flower opens wide in a blaze of color and a fire burns at its center. The petals are shifting past their prime and begin to curl at the edges. The flower fades further, petals crumple more. The full glory of the flower is gone. One tenacious petal remains attached. All the petals are gone. Only the glowing ember of a flower remains. As flowers bloom, age and wither, beauty can be seen in all the steps of the process. Love is at the heart of the journey. A love without judgment of whether they’re at the beginning or the end or how frazzled they look when it’s all over. Students of The Radiance Technique® (TRT®) are able to use TRT® hands-on while they are in nature, to help them tap into natural cycles and the love that connects us all. In our meditations, we can also become aware of the conditioning and judgments we place on ourselves of what we can or cannot love. We love the birth, but not the death, yet all of it is our ultimate journey. It's about being in love with death itself, but rather, holding love through the process that awaits all of us. See yourself as a blossoming flower. Mark this post so you can refer to it when needed. 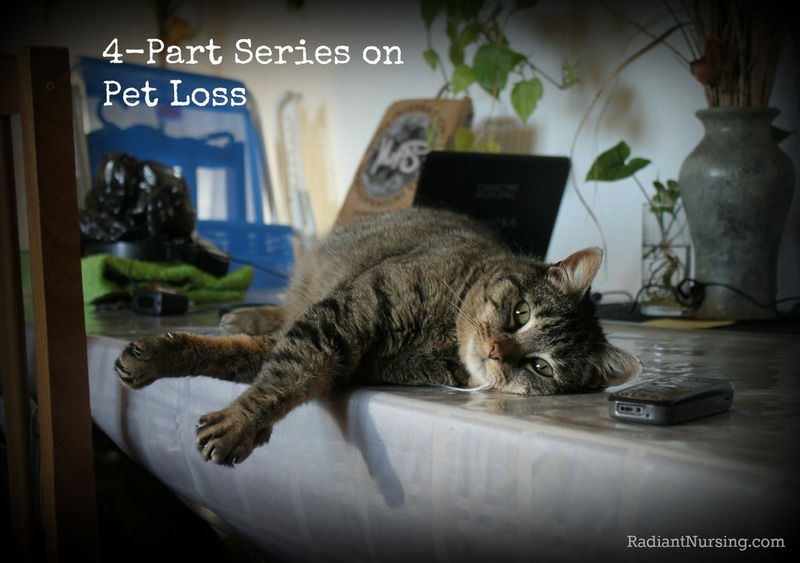 This contains the 4-Part Series of articles on pet loss. Save it in your favorites, on a Pinterest board, in Evernote or Dropbox, wherever it is that you save articles. With all four of them in one post, you have quick and easy access. You won't have to hunt around for them. Make a "note to self" where it is. You may not need it for another 5 or even 10 years. Hopefully your pets are strong and healthy as you read this. But one day, these articles will come in handy for you. This 4-part series won't tell you "what to do" – but, rather, give you ideas of what is available for you. You'll know, from deep inside, what is right in your situation. This article starts at the moment of we know we have to say goodbye and in the initial days of loss. Expressed in short phrases when sorrow is great, because even long prose is too much weight to bear. Perhaps only some of the phrases resonate for you or speak to you. That's okay. Sometimes reading the words of loss of others helps us not to feel so alone. There are also ideas of how to support yourself through loss with use of The Radiance Technique®. This article is the full process of saying goodbye to our pets. The decisions of how we will go forward with it – in-home euthanasia or taking the pet to the vet. Here we support in-home euthanasia and yet, acknowledge and respect different choices. An important tip here is the use of a chux during the process. In my experience, no one mentions this, so it will be up to you to advocate for yourself and have a chux ready, whether at home or at the vet. This article looks at the preparation you may want to take for your goodbyes. Discussed is how students of The Radiance Technique® (TRT®) can support themselves and their pets with TRT® hands-on as well as directing of energy. It also prepares you for how fast it is and supports you in the grieving process. It talks about deep grief, great love and the path we walk during this time. What a blessing we give our other four-legged members of the family – time for them to grieve and acknowledge that their furry comrade-in-arms has fallen. This is as important for the human members of the family as it is for the furry ones. Through many of the articles, we talk about Lap of Love – A Veterinary Hospice & In-Home Euthanasia as an in-home euthanasia service. They are a wonderful resource for information to help you and your pet through the end-of-life process. An important take-aways from this series is the idea of setting aside an "end-of-life pet fund." Over these many years of happiness with your pets, it is worthwhile to set aside money in a special fund that won't be touched until the day comes. A little nest egg of even $300–500 will be a welcome relief when the time of loss arrives. You will then be able to make decisions based on what your heart tells you, not just on what your wallet says. It gives you freedom of choice. No one wants to think about this, that a time of goodbye looms ahead for all of us. Yet, I firmly believe "forearmed is forewarned" and knowing our choices ahead of time benefits everyone. Tuck this away, somewhere where you can find it again. 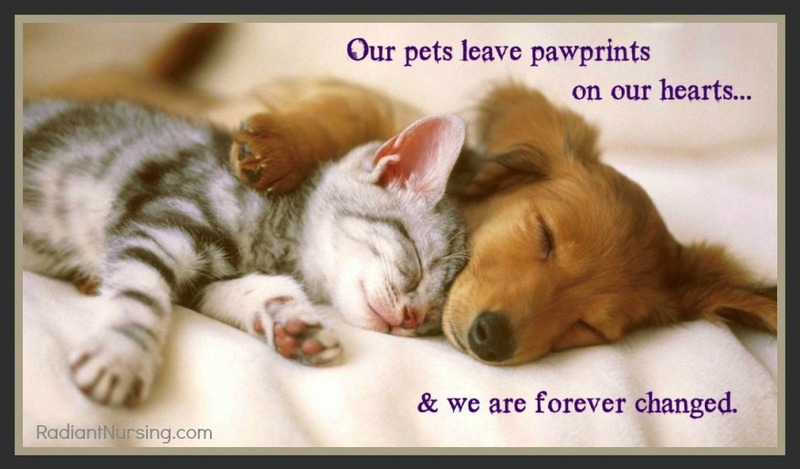 And, in the meantime, carry on – enjoy, play, and create all the love you are able to muster with your beloved pet.